Richard Guy Wilson. Harbor Hill: Portrait of a House. New York: Society for the Preservation of Long Island Antiquities with W.W. Norton Company, 2008. Pp.178. Photographs, illustrations, architectural designs, endnotes, index. ISBN: 0393732169. $60.00. Ever since the destruction of Harbor Hill, the subject of this once grand estate on Long Island’s Gold Coast has deserved a resurrection at the hands of some writer, author or researcher. 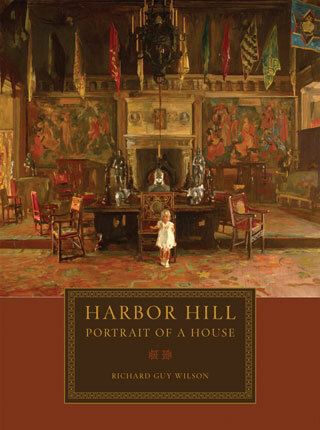 Finally, the tale of this home and the family that built it is available in the Society for the Preservation of Long Island Antiquities’ (SPLIA) new book, Harbor Hill: Portrait of a House. For those of you unfamiliar with the subject, Harbor Hill was the large summer estate of the Mackey family built overlooking the village of Roslyn, Long Island. Completed in 1902 for the exorbitant sum of $830,000, it was demolished just 45 years later, to be replaced by row after row of single-family homes. Harbor Hill was, essentially, a creation of an American aristocracy that wished to mirror themselves on the nobility of Europe. The Mackey’s conception was the genuine importation of the Continental Country House to America. While many wealthy Americans looked to British or Colonial Revival models for inspiration, the Mackeys and their famous architect, Stanford White, instead chose to rely on French history and tradition for the design of their home. The house would become both a monument and, eventually, a folly, to the idea that like their European counterparts their families would occupy these estates for centuries to come. I was admittedly nervous about this book initially, mainly because of the person who had been selected to author it, Richard Guy Wilson. Wilson, the noted architectural historian and head of the University of Virginia’s Architectural History department, is certainly no novice to the history and development of architecture in America. He was, for several years, one of the hosts of A&E’s America’s Castles, which introduced Americans to the many grand houses built across out nation. However, Wilson has always come off as rather elite and aloof to this reader and I was worried that this new book would bear a far too striking resemblance to its author. I was pleasantly surprised to discover that Harbor Hill was not the daunting experience anticipated. Rather it was an entertaining tale of the Mackey family and their creation of what was once one of the most elaborate and expensive summer estates constructed in the United States. Of particular note are the extensive construction photographs of the residence. So often, evidence such as these images is not available and they lend an important visual aspect to the book. One other important item to be found within its pages is the detailed information on the staff that once ensured the smooth operation of all aspects of the estate. Again, often this information is not well documented or has been lost to time – but here we find it recounted in extensive detail. Today, it is hard for any of us to even begin to comprehend an inside and outside staff, at its height, encompassing over 125 individuals. For those who are interested in the Country House Era, this book offers more than could usually be hoped for on the topic. There are a few minor details that would have made Harbor Hill even better. The addition of a brief genealogical chart of the family would have been a helpful improvement; after all, there has always been little information available locally on the Mackeys. In addition, the sampling of color plates placed rather clumsily before the title page (almost as an afterthought) could have also been handled with more care. On the whole, though, this book offers a well-presented narrative and a fairly good template for the telling of the history of any other of the important houses on Long Island. If only we could find the funding for that work!